In 1916, the American home – and kitchen – looked vastly different. It was in this year, William E. Cranston founded Thermador, the luxury appliance brand that offers real innovations for real cooks. At this year’s Architectural Digest Design Show at booth #393, the brand is celebrating its milestone 100th anniversary and showcasing innovative new products and solutions for ultimate kitchen personalization. In July, Thermador will continue its heritage of innovation by introducing a new category of its iconic cooking appliances: two 60” Pro Grand® Ranges that offer more ways to personalize the cooking experience than any other professional-style gas range of this size. 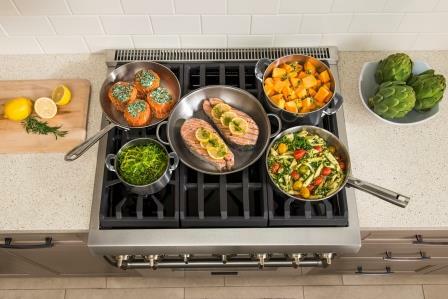 The 60” Pro Grand® Ranges enable culinary enthusiasts to personalize the features of the range around their unique style of cooking. Each gas range is equipped with six patented Star® Burners, including four that offer the ExtraLow® simmering feature and a 22,000 BTUs Power Burner. 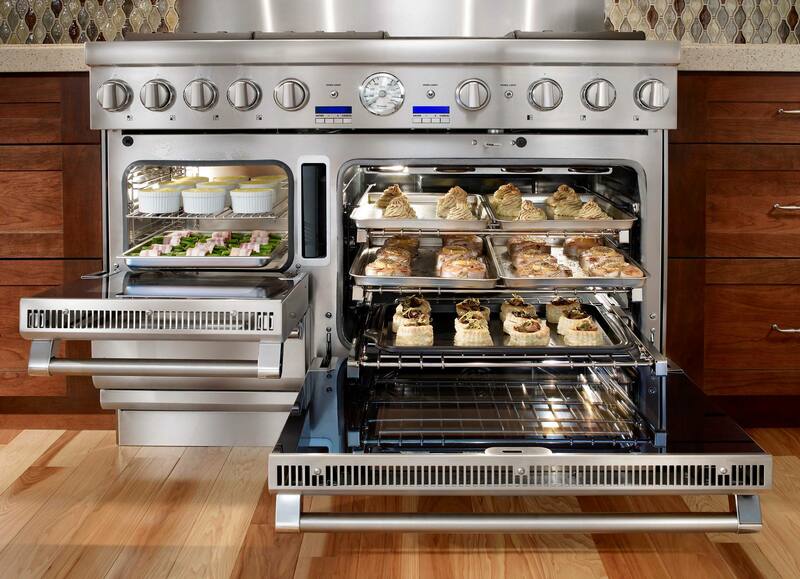 Beyond that culinary enthusiasts may select various combinations of cooking on the surface and interior of the appliance – including the choice of two side-by-side convection ovens that offer the most oven capacity of any 60” range on the market. Additionally, as culinary enthusiasts continue to desire an array of appliances that enable personalization in entertaining zones throughout the home, Thermador is introducing new additions to its built-in, fully customizable Freedom® Collection Culinary Preservation line: the Wine Reserve Refrigerator and Double Drawer Refrigerator. These new additions are an ideal complement to Thermador built-in refrigerators, offering more ways to create a custom culinary preservation configuration anywhere in the home. As personalization continues to take hold, unique details, colors and materials in design continue to be incorporated into home design. This is especially true for culinary enthusiasts and ultimate entertainers, who desire a complete and effortless entertaining experience anywhere in the home. Thermador continues to be a leader in providing an amazing array of design possibilities with its Culinary Preservation Centers, and at this year’s show is showcasing inspiring ways to get creative with materials, color and textures to transform highly customized refrigeration configurations into a functional work of art for the home. For more information about the new Thermador appliances and details on how Thermador is celebrating its centennial, visit the Thermador website. Thermador is sponsoring and hosting KBTribeChat on March 23, to discuss kitchen design and take a look back at the 2016 Architectural Digest Design Show. Join us on Twitter from 11am-12pm PT/2pm-3pm ET by adding #KBTribeChat to your tweets! • What trends were featured at @ADHomeDesign that you are most excited about? • Personalization continues to be important – what unique design details are your clients requesting? Share photos! • Thermador showed customizable Culinary Preservation Centers: besides the kitchen where else do clients want refrigeration? • When designing for someone who loves to entertain, what appliance is typically the most important/first to be selected? • Thermador turned 100 this year: in the last century what do you think is the most important innovation in kitchen design? • What appliances/conveniences do your clients desire in other rooms, such as the master suite, media room or guest room? At the Architectural Digest Home Design Show, Thermador – the luxury appliance brand that offers real innovations for real cooks – is showing its solutions for ultimate kitchen personalization and demonstrating how its innovative built-in modular refrigeration and cooking products address every design, cooking, and entertaining style desired by culinary enthusiasts. Personalization is growing in importance as more activity takes place in the kitchen, with family and friends becoming active participants in the meal preparation. The cooking experience is now an integral part of any gathering, and culinary enthusiasts want their home to feature a ‘kitchen theater’ designed in a way that enables them to welcome more cooks in the kitchen and put on their best cooking performance. This often means larger spaces, multiple cooking appliances and thoughtful layout that places the appliances in locations that are most useful to the cook. Thermador is a leader in personalization, offering innovative cooking and cooling appliances that address nearly every design and cooking style. For example, there are now more choices for the cooking surface with the recent launch of the Professional Grill feature for rangetops and ranges, and beginning in June 2015, Thermador will offer the only range and rangetop that can be installed with zero clearance against a combustible wall – the new 30” Five-Burner Pro Rangetop and 30” Five Burner Pro Harmony® Range. 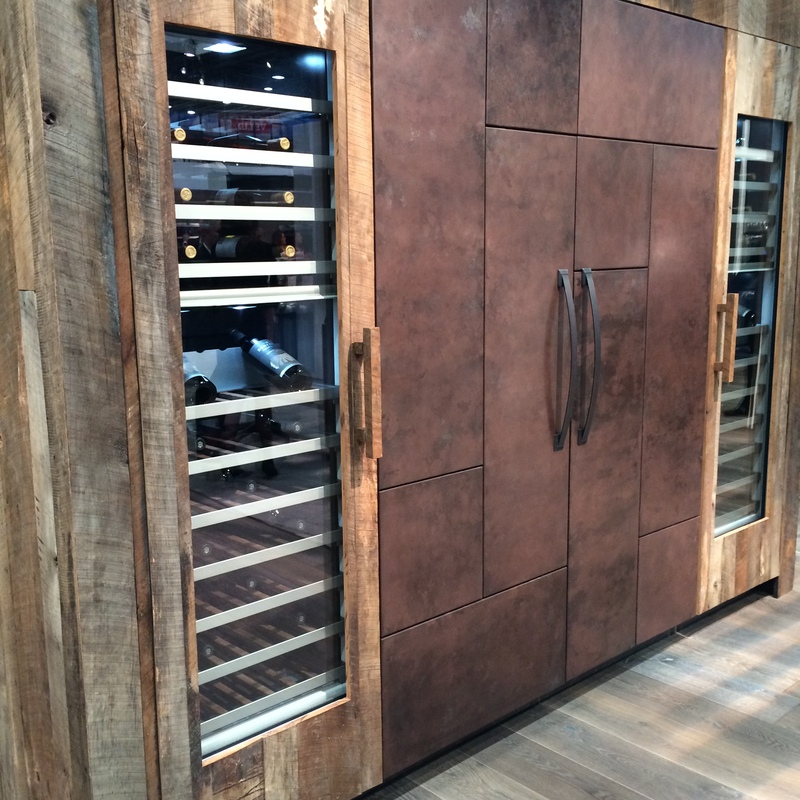 Thermador also originated the concept of built-in modular refrigeration with the Freedom® Collection line of refrigeration, freezer and wine columns, and made it possible to break up the traditional side-by-side installation to virtually any configuration a culinary enthusiast wants. The return of the pioneering, industry-leading One-Two-Free® promotion provides outstanding value when welcoming Thermador into the home, featuring savings of up to $6,097. Those who purchase any Thermador range, or any cooktop plus any oven, qualify to receive a free dishwasher. Embracing personalization, this year Thermador offers more choices for free appliances when refrigeration is added to a One-Two-Free® package. Culinary enthusiasts may now choose from an array of appliances that best suit their personal cooking and entertaining style, such as: a free MicroDrawer® Microwave, a second free dishwasher, free ventilation or they may receive a 50 percent discount on a Built-In Steam and Convection Oven. To begin planning the ultimate kitchen, visit Thermador.com and browse through the dazzling collection of innovative and powerful appliances that allow real cooks to shine in the kitchen. 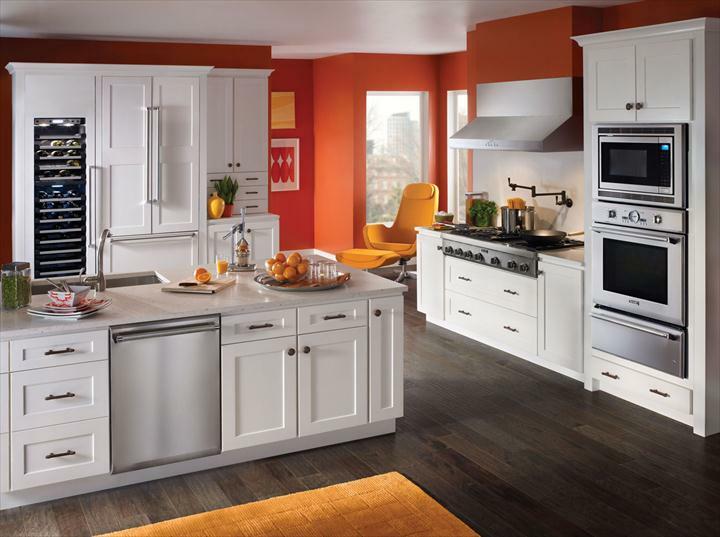 to discuss kitchen design and take a look back at the 2015 Architectural Digest Home Design Show. Q1) What trends were featured at the Architectural Digest Home Design Show that you are most excited about? Q2) Are there any design details from the Architectural Digest Home Design Show already being used in your current projects? Share photos! Q3) Thermador originated the built-in modular refrigeration concept. Do you see more clients separating fresh food and freezer? Q4) Are you seeing a change in the way home owners utilize appliances inside the home? Q5) What innovations did you see the Architectural Digest Home Design Show that will inspire your designs? Q6) Thermador has unveiled solutions for ultimate personalization this year. How do you design for the unique needs of clients? On Wednesday, August 22, Thermador is hosting kbtribechat on Using Technology In Design. Please join us on Twitter from 2 to 3pm eastern time. We are proud to have Thermador sponsor and host this kbtribechat. 1. How do you use technology in your consulting process with clients? 3. How have you used technology to aid in your design? 4. How are your clients using technology? partnering the design process with technology? Here is the transcript for this #kbtribechat.